This saucy condiment was created in Collinsville, Illinois and was produced at the base of the World's Largest Catsup Bottle. The Brooks brand name gained nation-wide attention as once being the best-selling "tangy" catsup around. Today, the Brooks brand is owned by our friends at Birds Eye Foods and has very limited distribution. 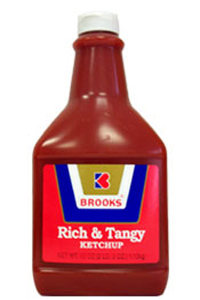 Folks all over the U.S. will never forget the distinct flavor of Brooks Old Original Rich & Tangy Catsup! You may click the "Buy Now" button for the quantity below and place your order instantly! We accept direct payment through PayPal and credit card payments through PayPal. Due to shipping and handling constraints, there is a maximum of 6 bottles of ketchup per purchase order. Multiple orders are welcome! Also note that we will not fill orders with international addresses. We cannot ship outside of the United States. We also accept checks and money orders with our mail-in order form. Click here for mail-in order. We also accept checks and money orders with our mail-in order form. Click here for mail order. Due to shipping and handling constraints, there is a maximum of 6 bottles of ketchup per purchase order. Multiple orders are welcome! Also note that we will not fill orders with international addresses. We cannot ship outside of the United States. If you have any questions, send an email to catsupbottle[@]me.com or call 618/344-8775.